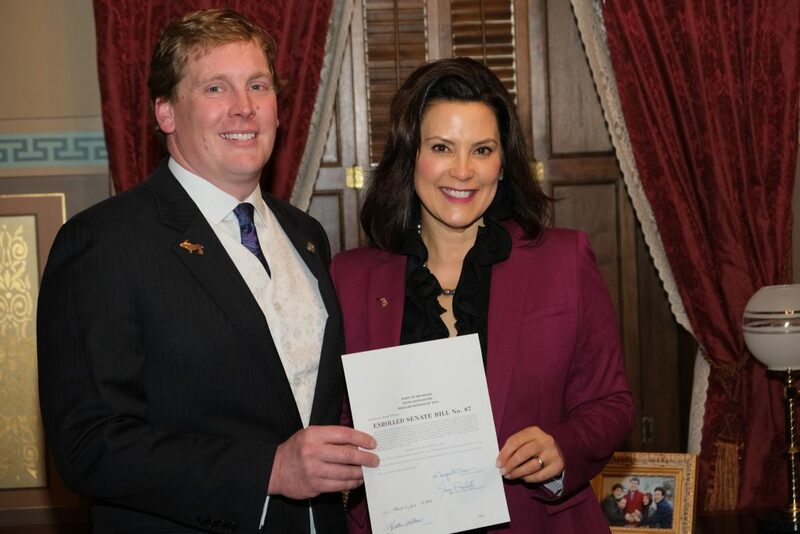 Legislation sponsored by State Senator Ed McBroom is now the first bill signed into law by Governor Gretchen Whitmer. The Governor signed the bipartisan Senate Bill 87 to amend the Revised Judicature Act which means a judgeship slated to be eliminated in Menominee County’s 95th-A District Court will be retained. Preserving this seat will also help the community establish a drug treatment court to combat the opioid epidemic in this part of the state. Senate Bill 87 passed both chambers in the Michigan Legislature unanimously. McBroom joined Whitmer Thursday for the bill signing along with State Representatives Greg Markkanen, Sara Cambensy, and Beau LaFave. Senator McBroom introduced SB 87 after the current district court judge for the 95th-A district, the Honorable Judge Jeffrey Barstow, announced plans to retire on March 31st, 2019. Under the current act, this would eliminate the district judge position.